The Malawi Defense Force has announced plans to plant 50,000 trees as part of environmental conservation efforts. The soldiers, led by their Commander General Griffin Spoon- Phiri, said this in Mzuzu on Friday when launching the exercise at Moyale Barracks. 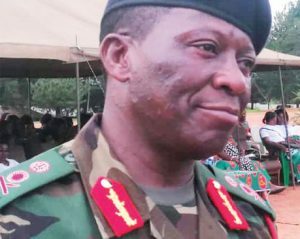 Spoon-Phiri said the soldiers have also received K4.2 million from Press Trust for use in the initiative. “This is a very important exercise and we appreciate the support we have received from our partners. The importance of tree planting cannot be over emphasised. “One of our enemies is deforestation and we shall deal away with this. I am saying this because for us, soldiers, forests are our second home and we need to take care of them,” he said. Press Trust trustee, Amos Maliro, said they are concerned with what he described as “alarming levels” of forest depletion. In the last 11 years, the trust has supported the government and its partners with over K72 million.